Cricket has been played in Buriton for well over 100 years. It started when two village teams challenged each other, “the losers paying for beer, bread and cheese.” The pitch was just a grass patch at the top of Hall’s Hill or on nearby Haydown. It was not rolled or marked, according to the Women’s Institute Scrapbook, compiled 50 years ago. There was a simple ‘block hole’ for a crease, bowling was fast underarm and a hazel stick was used for scoring with a notch cut for every run scored. Later the game became less makeshift when men began to play regularly on the Rectory Meadow at 4 o’clock after work on Saturday afternoons. In 1895, the Parish Council rented a piece of ground from the Manor Farm — a field off Bones Lane, where the house appropriately called ‘the Wicket’ now stands. A pitch was prepared and Buriton Cricket Club was officially founded. Players, their pads and bats slung over their shoulders, walked to play away games at Petersfield, Clanfield and as far afield as Harting, Rogate and Bordon – and would then walk home again after the match. Later there was the luxury of travel by horse and wagon. Very little documentation is available about those early days, so if you have any scorecards or photographs, please tell the Buriton Heritage Bank. We do know, however, that Buriton fielded three teams up to the first world war, so cricket was an important part of village life from the very first days. The ground at Bones Lane was used for around 30 years but there was no pavilion. Players would huddle under an oak tree and troop across Bones Lane to number 55 for tea. Mrs. Charles Pretty and her helpers would serve the home team in the front room and the away team in the back room of the small agricultural cottage. This was not segregation; there simply wasn’t enough room to accommodate all 22 players together. A 1924 report of a game between Buriton and Petersfield ‘A’ in the Hants and Sussex News records: “This most enjoyable match was played at Buriton on Saturday in ideal weather but the wicket was still very wet and generally favoured the bowlers, so that the scores were very small, no batsmen reaching double figures. Petersfield made a bad start as four wickets were down for eight runs. Wilson and Browning then made a stand and brought the score to 22. But after these men were separated the remaining wickets went down for a final total of 34 runs. George Legg, four wickets for seven runs; P. Legg one for seven; J. Legg two for six; and Harfield three for five. Buriton did not fare much better …. eight wickets were down for 20 but the remaining batsmen played steadily and the last wicket fell at 36 leaving the home team winning an exciting game by two runs. Mrs C. Pretty provided a capital lunch and tea for both teams.” There is an interesting footnote to this game: some thirty years later, George Legg was still playing. The Leggs and the Prettys were two of several Buriton cricketing families. At one time the two families could produce enough players to make a combined team. Philip Pretty, a former club secretary who lives in the village today, recalls stories told to him by his father. Curly Pretty, Philip’s grandfather, made Philip’s father, Wilf, and his brother, Stewart, whiten all the team’s pads, in return for which they were allowed to travel to occasional away games. Colonel Bonham Carter was president and chairman of Buriton Cricket Club for some time. One evening, Wilf Pretty was summoned to see him before net practice and had gone along, perhaps a bit apprehensive about what the Colonel might want him for. The Colonel told him that he felt that the pitch had a couple of bare patches in it and instructed him to go to the lawn of his Manor House and “take up a couple of turves and repair it.” Yet another Bonham Carter, Christopher, private secretary to Prince Philip, played for Buriton from time to time. He was, apparently “quite a big chap and a bit of a hitter, too,” according to one source. In the mid 1920s, the club moved from Bones Lane to its current pitch when the Parish Council acquired the Recreation Ground. Reports from 1927 suggest that there might have been some haggling with the Trustees of the Buriton Estate, who wanted £300 for the land. The Parish Council finally paid £250 and agreed to set aside a further £50 to lay the current cricket ground. For some years, the square was chained off to keep grazing cattle out although they deposited a few ‘obstacles’ in the outfield. But that was probably in keeping with the best traditions of the rural game; the same thing had happened at the Bones Lane ground. Again, there is very little on record about the village team between the wars so, please, if anyone has any information, do let us know. One fact is for certain: Buriton had a formidable team and was often invited to play matches to ‘open’ new pitches for nearby clubs. 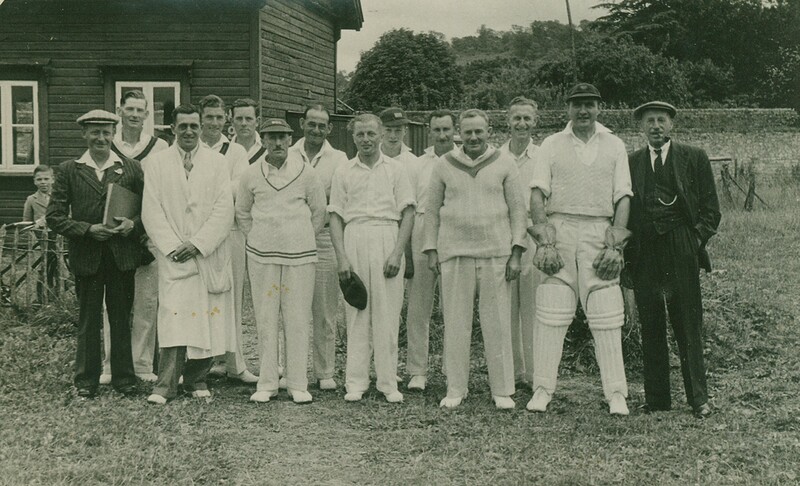 In 1936, they played at Broadha’penny Down, Hambledon, the so-called birthplace of modern cricket. “The Hon Secretary, Mr C Hutchins, in his report said that he had fixed up more games this year than in previous ones and that altogether the club had 40 matches to play, 23 at home and 17 away. Mr G Legg, after having held the captaincy of the club for 31 years, declined to stand again, and told the meeting that a younger man should be given the chance. Mr W. Pretty was elected captain, Mr. H. Hill vice captain. The chairman proposed a hearty vote of thanks to Mr. G. Legg and said that after his wonderful service over a period of 50 years, the club was losing a captain who was part of the club itself. The working committee was elected as follows: Messrs F Haimes, P Anthony, P Legg, W Kingsmill, R Carter, S Pretty, G Legg, W Pretty (capt. ), H Hill (vice capt.). In closing the meeting, the chairman proposed a vote of thanks to the ladies who were responsible for the tea.” For the record, George Legg played cricket up to the age of 71. 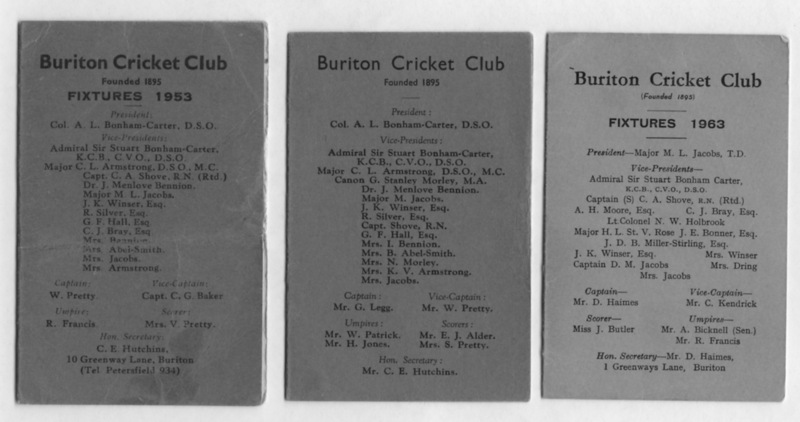 Quite apart from the Leggs and Prettys, other Buriton families played throughout much of the 20th century – Albuery, Francis, Rutter, Bicknell and Haimes dominated the score cards for decades. The post war years were undoubtedly a ‘golden age’. Cricket was a passion and it was regarded as a privilege to represent the village. In 1949, the club had 37 fixtures, playing every Saturday and Sunday. Buriton has always preferred to participate in village, rather than league cricket, though records show that the team was always capable of beating first class clubs like Petersfield. More recent history is better recorded and these reports from the Parish Magazine may jog a few memories. The 1982 season, for instance, showed that Buriton Cricket Club won 14 games and lost just four. The team performance was consistent with many high scoring games. Dobbie Haimes made 215 runs at an average of 26.87, top score 80 not out and Ron Albuery amassed 257 runs at an average of 18.34 with a top score of 75. Ron Albuery also took 29 wickets at a respectable average of 7.48 though John Neat and P Heslop took more wickets and had slightly better averages. The following year, Ron Albuery was once again the most successful batsman, scoring 347 runs at an average of 26.69, the most runs scored in a single season for 15 years. No centuries were scored but Tim Samworth came closest with 89. The best bowling performance was John Neat with five wickets for one run against West Meon. In 1988, the award for the most promising player went to another Albuery – Jason. A prescient award, as it happens: Jason is the club captain this year (2001). His brother, Gary, was captain the previous year. Another current member of Buriton’s cricketing families is Darren Francis, fast bowler, hard hitter and the man responsible for keeping the table in good trim. During the early 1990s, the team was reformed following internal problems and disputes and for legal reason was renamed Buriton Village Cricket Club. The club has hosted several charity matches in recent years. Games against the cast of ITV’s television series, “The Bill” became popular annual events attracting good crowds; the final match in 1999 raising £3000. Unfortunately, only four members from “The Bill” turned up, despite a promise of a full eleven. “The Bill” actually won the match for the first time, helped on the way by two key Buriton players, Robin Standen and Darren Francis, who turned coppers’ narks and played for the opposition. But for the crowd who turned up to watch their favourite TV stars it was a disappointment and it was decided too risky to organise future matches. In 2001, the club had 20 home and away fixtures, some against the village teams it played almost a century ago. But how long will this last? A more transient population, and lack of proper cricket coaching at many schools, makes it more and more difficult for villages like Buriton to continue playing cricket. Without young players the game will become an endangered species. If you know any more about cricket in Buriton or about any of the players, or if you have any old photographs of cricket teams or cricket matches, please let us know. “My brothers and I were all very fond of the game of cricket, and so was my father – not that he played often. Our employers, the Bonham Carters, also enjoyed a good game and we were all members of our local Village Cricket Team. My father loved the game so much, though as I have said he rarely played himself, that he would work like the very devil to get things done on the farm to free us lads to get away for the games. I remember he would give us half-a-crown (2/6d) if we made 50 runs and five shillings for 100 runs. My brother George managed to win that 5/- once. But many is the time that my father had to hand out the money for 50 runs at a time ! My dear old mother used to wash our cricket clothes – and with so many sons the washing was long and hard. Our cricket boots we cleaned ourselves and this we did with white chalk and a liquid whitener. Four of us lads were in the Buriton Team just after the war of 1914-1918 and continued right up to the commencement of the Second World War in 1939. We only played Saturday afternoons, Whit Monday and August Bank Holiday with an occasional evening game. When I first started playing cricket I remember being taken to away matches by a two-horse drawn vehicle which was hired for about 5/- (25p) just for the afternoon and our ‘Fee’ was quite small then. The away games were played in surrounding villages – Harting, Petersfield, Liss, East and West Meon, Clanfield, Charlton, Horndean and Compton. If the hills were steep, and they were at Harting (! ), we would all have to get out and help push to enable the poor horse to reach the destination. We took it all in good part and it was good fun and the game was always a ‘blood’ match. “In due course coaches were used for transporting players. The cricket club got more and more members and Fees went up to 5/-d for playing members, 2/-d for non-players. The ‘Playing Away’ Fee was 6d and non-playing Fee 1/6d for the journeys – many of the journeys would be long ones. The advantage of going on greater journeys meant that the clubs were fairly large ones and would have better playing fields, in particular the County Ground at Portsmouth and the Grammar Schools Masters Ground at Northend; the Officers Ground at Winchester; and the Playing Fields at Havant. Later on, our own fields were improved and we eventually had the best team ever at Buriton – in fact two teams – and very proud to say all were Buriton Boys. The financing of our Club was helped along with a huge Whist Drive held once a year and as many as forty tables would be playing. Then came the Second World War and goodbye to practically all village cricket for many years, but now in 1979 it blooms again and the Club is as big as ever it was. This information was written in 2001. Do you know any more about Cricket in Buriton or about any of the players? Do you have any old photographs of cricket teams or cricket matches?